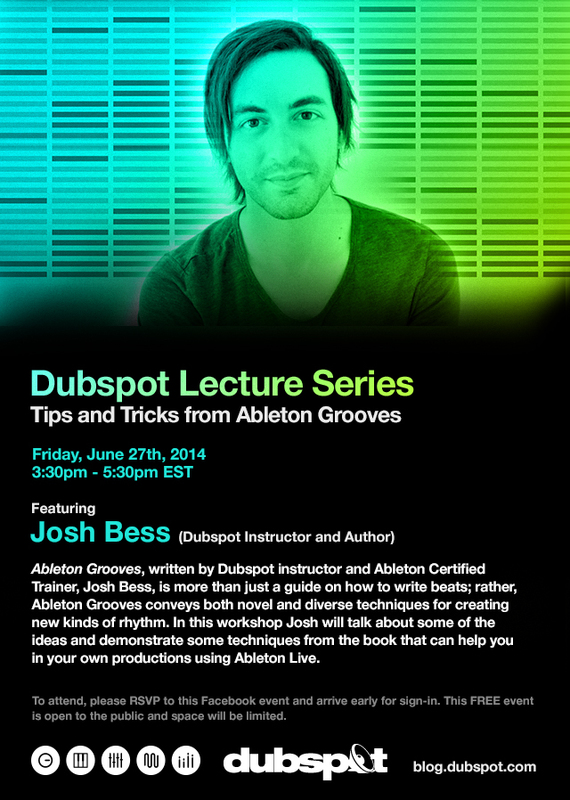 On Friday June 27th, our Dubspot Lecture Series continues with a discussion and workshop based around instructor Josh Bess’s new book, Ableton Grooves. Interested in taking Music Production w/ Ableton Live classes Dubspot? We have classes starting 7/21 and 8/4 in NYC and 6/21, 6/22, and 9/22 in LA. This course is also available online. Register today! Ableton Grooves, written by Dubspot instructor and Ableton Certified Trainer, Josh Bess, is more than just a guide on how to write beats; rather, Ableton Grooves conveys both novel and diverse techniques for creating new kinds of rhythm. In this workshop Josh will talk about some of the ideas and demonstrate some techniques from the book that can help you in your own productions using Ableton Live. To attend, please RSVP on our Facebook event page. This FREE event is open to the public and space is limited.